Fordham students working in a community garden in the Bronx in September, as part of the annual Urban Plunge. It’s a phrase that’s uttered often in Jesuit circles, and at Fordham, it’s been exemplified through programs such as the Dorothy Day Center for Service and Justice and Global Outreach. This year, as part of an effort to advance and expand that work, Fordham’s Office of Mission Integration and Planning launched the Center for Community Engaged Learning. Fordham’s College Access Program, which is overseen by the Center for Community Engaged Learning, brought student “ambassadors” together this fall with students from Mott Hall High School. Arto Woodley, Ed.D., the center’s executive director, said the goal is to streamline operations, provide support for faculty who integrate community-engaged learning in their classes, and help students become civic leaders. “When we say, ‘We’re working with the community,’ what does that really mean? Are we working with certain neighborhoods? Are we working with certain zip codes? What’s our emphasis? How do we engage with them?” he said. As part of the reorganization, the Dorothy Day Center and Global Outreach no longer operate as independent entities. Former Dorothy Day Center director Roxanne De La Torre has assumed the title of director of campus and community leadership in the larger center. 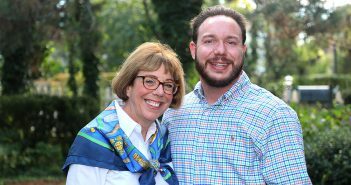 Likewise, Paul Francis, who had been director of Global Outreach, has assumed the title of director of programs and operations. Woodley said the level of community outreach, leadership development, and faculty support should increase significantly with the reorganization. This, he said, will honor the legacy of Day, for whom the University’s Community Service Program was renamed in 2009. 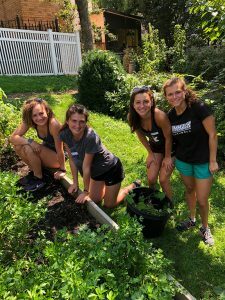 Urban Plunge, a pre-orientation program for first-year students who share a commitment to community service, reflection, and social justice, is one of the programs that falls under the umbrella of the Center for Community Engaged Learning. Faculty will be a key part of the center’s new focus. That’s because like the residents who live near Fordham’s campuses, they have long-lasting ties to the community. The goal is to develop deep and sustainable relationships between the two groups that will provide a context for students to learn. “At many institutions, it’s activity-based. You know, we sent 50 students to a soup kitchen, they stacked 100 cans, and they gave those cans to five families. Our whole goal is to make sure we expand the boundaries of engaged scholarship beyond that,” he said. Not every subject taught in the University naturally lends itself to engaged scholarship, but for some professors, it is a powerful tool. 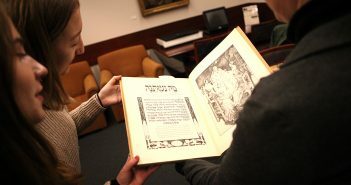 Karina Hogan, Ph.D., an associate professor of theology who was part of a faculty advisory committee on community outreach, plans next semester to have students in her Sacred Texts of the Mideast class examine the ways in which Judaism, Christianity, and Islam address themes of social justice in their texts. They will split into three groups and work out of a New York City synagogue, church, and mosque, where they will be able to observe how members of the respective congregations put words into action. “The idea is to really get out and see how these ideas are actually put into action. I think it’ll be a good addition to the class,” she said. For Carey Kasten, Ph.D., associate professor of modern languages, it would be inconceivable not to send students in her Spanish Language and Literature class off campus. “They live in this community, and I want them to see that they’re capable of engaging civically with their community, ” she said. In the past, Kasten has found partner organizations to work with both on her own and through the Dorothy Day Center. It can be a logistical challenge; since many only need three to four students, she works with several different groups to place all her students. She’s intrigued by possible connections the Center for Engaged Learning will create, and hopes they will add to those that happen organically. A good example is the immigrant support group New Sanctuary Coalition, she said. Although many students have been referred there via faculty, several have found the group on their own and incorporated volunteering there into their own studies. Ideally, Kasten said, she’d also like to connect volunteer opportunities to her research agenda, something that Woodley said the center will focus on as well. “I’ve really struggled with how to bring some of this work out of the classroom and into my research. I hope to see examples from faculty members on how to do this,” she said. One of Kasten’s students, Colleen Kelly, a senior at Fordham College at Lincoln Center who’s majoring in social work and Spanish, used a Dean’s Summer Research Grant to intern last summer at the Northern Manhattan Immigration Corporation. She was interested in learning what it actually means for New York City to be a sanctuary city. She learned that immigrants who are in the country legally are being discouraged from applying to become citizens because seemingly minor crimes—such as jumping a turnstile—on their record might trigger a visit from Immigration and Customs Enforcement. “In this time, it’s very critical to have an open definition of sanctuary and realize, in terms of the immigrant community, it’s always changing because the current administration is instilling a lot of fear of anyone who’s not a citizen,” she said. Both this internship and one she’s currently doing at a school in the Bronx, where she’s assisting a social worker, have been directly informed by her classwork. “I also know if a client comes to me and they need help with their asylum connection, I now have connections,” she said. Woodley said establishing successful partnerships will go a long way toward helping Fordham fulfill the tenets of its Jesuit heritage. “When Jesus was asked by the Sadducees what the greatest commandment was, he said to love the Lord thy God with all your heart, mind, and soul, and to love thy neighbor as yourself,” he said.